If you have a missing tooth or missing teeth, dentures are a viable and attractive option to consider. 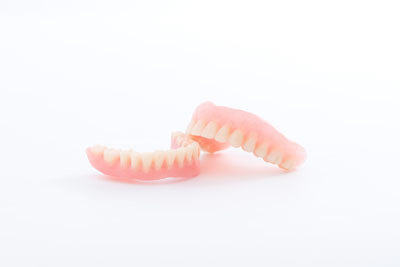 Some even need to contemplate getting a full set of dentures, also known as a complete denture. When this time comes, you may want to learn more about how dentures are created and customized for your specific needs. The creation of all dentures begins with a simple exam. We will thoroughly inspect the teeth and gums to determine if there are any areas that need treatment outside of the need for dentures. We will make sure the patient's gums heal and if the patient went through a recent tooth extraction. If everything looks healthy and intact, we will make an impression, commonly referred to as a mold, of the gums and teeth if any remain. We will also take the necessary measurements of the dental structure that will help a lab to customize the dentures. We will help the patient determine what color shade he or she wants the dentures to be, as well. In some situations, we will have a dentures mock-up for the patient to try on before the final product is ready. When the patient comes in, he or she will try on this mockup and bite into a wax base so we will know what adjustments we need to make. We will also determine how the top and bottom dentures fit together, or how the dentures fit together with the teeth. This stage is necessary, so we can create the best possible fit for the dentures. We do not want the patient to have to be constantly readjusting the dentures or for the dentures to fall out of place or slide around. Once the personalized dentures are complete, the patient will come back to our office for a final fitting. The patient will try the dentures on, bite and speak with them in the mouth in different positions to make sure they stay in place. If the fit is secure and the patient is happy with the final product, then the patient can leave our office with brand new dentures. Many times people will complain about the speech problems dentures can cause at first. The patient will eventually get used to speaking with the dentures in place, but at first, it may take some time to talk without a lisp. The more a patient practices, the easier it will become. Some people experience irritation if they are not used to dentures. In some cases, this can be caused by dentures that do not fit properly. We hope to avoid this problem by performing fittings, but sometimes it happens anyway. Let us know if the patient is experiencing any irritation. Once you receive your full set of dentures, we know you will love how you look. You will be able to eat and speak with your dentures successfully. We hope that we have helped fully explain the dentures process so that you can look forward to having your dentures created from Roderick A. Garcia, DMD PC.